This article is reprinted from the March, 1999 edition of Your Jerusalem. One of the longest stretches of straight road in the entire city of Jerusalem — indeed, until the recent spate of building roads, tunnels and bridges, the longest straight road, is Kanfei Nesharim (Eagles’ Wings). This road runs as straight as an arrow from Kiryat Moshe, almost as far as the beginning of Har Nof — a distance of some three kilometers. In a city built on a series of hills and mountains, where streets for the most part follow natural contour lines, this is unusual. The street which is today called Kanfei Nesharim used to be a country lane, leading from Jerusalem (which, a century ago, extended no further than Machane Yehuda) to the village of Givat Shaul (today a suburb of Jerusalem). After the village of Givat Shaul, the road became a dirt track continuing through various Arab villages; it eventually wended its lazy way to the coast. By the 1940’s the road to Givat Shaul had already been paved. In the wake of the Second World War, when both Zionism and Arab nationalism were vying for control over the country, many small, outlying settlements — both Jewish and Arab — assumed tremendous strategic importance. This became even more pronounced when the Arab forces laid siege to Jerusalem. One of the main tasks of the Jewish Haganah (the “official” Jewish defense organization) became to break the siege, and to provide Jerusalem with food, water, and all the other supplies needed by her inhabitants. For this purpose, convoys were sent from Tel Aviv. So far as was possible, they traveled on the Tel Aviv-Jerusalem highway; but Arab sniper attacks on those convoys, especially around the Latrun area, often prevented trucks from passing. 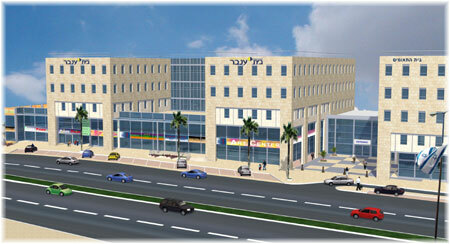 Therefore, the back roads to Tel Aviv — primarily, the road leading past Givat Shaul — became crucial. In late 1946, the Haganah decided to prepare that road as an “underground” landing strip. To this end, they straightened it out and paved it. It must be remembered that, in those days, what is today the industrial zone of Givat Shaul was a few miles outside Jerusalem, in the middle of the countryside. From that area, there was an unbroken view by day north-westwards as far as the coastal plain, and by night, the lights of Jerusalem could just be dimly seen on the horizon. When the siege of Jerusalem was at its height, the Haganah flew in supplies, materiel, food, even, on occasion, soldiers. When this happened, they would station a soldier at each end of the road to keep traffic away; aircraft would usually land, unload and take off again within a very few minutes. The landing strip was, after all, illegal. In the final weeks of the British rule, David Ben-Gurion decided to build a permanent airfield. This never actualized. At the far (i.e. western) end of the road / landing strip, the area which is today the entrance to Har Nof, lay an Arab village which had been taken over by the Arab Higher Committee. From this village, Arab soldiers attacked Jewish convoys with machine guns and cannon, while mortar fire fell on aircraft damaging both them and the makeshift runway. 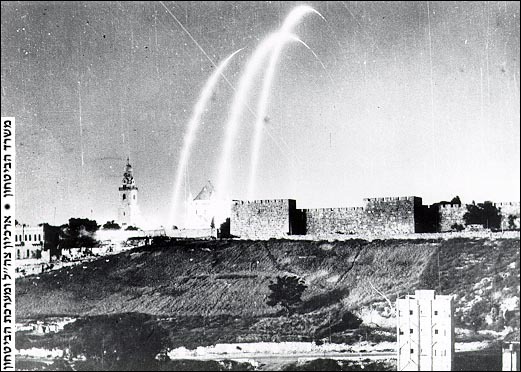 On 3rd April, 1948, the Haganah launched Operation Nachshon. This, their biggest operation to date, was designed to relieve the siege on Jerusalem by capturing the high ground on both sides of the Jerusalem-Tel Aviv highway, as well as some of the surrounding areas. 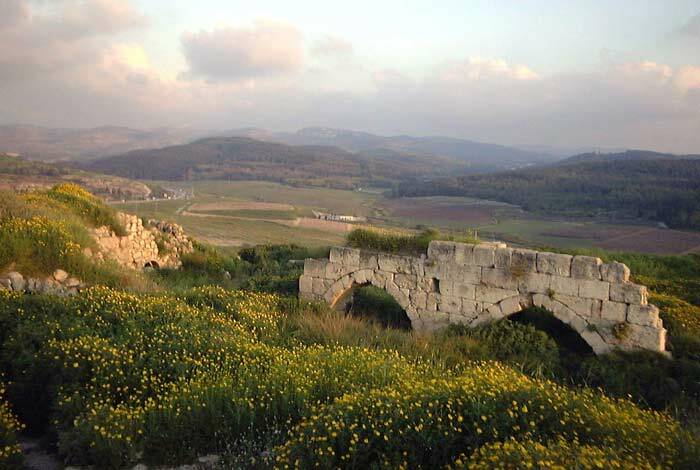 On 9th April, the Haganah fought to capture Kastel (the Latrun area). Simultaneously, a joint I.Z.L. and Lehi force attacked the village at the western end of Kanfei Nesharim. The battle lasted for over half a day; so well armed was this village that by the evening, when the Arab forces finally surrendered, fully one third of the Jewish forces — initially 120 strong — had been wounded or killed by Arab fire. The name of this village was Deir Yassin. Few of its original buildings still stand; today, where this pivotal battle was fought, Egged has a bus terminus; a petrol station stands where Arab snipers stood on a rooftop firing at Jewish forces. And, just after the roundabout, set a hundred meters back from the road, is a cluster of the original stone buildings. Their outside has changed little in half a century; but today, under the name of Kfar Shaul, they house one of Jerusalem’s main psychiatric hospitals. Daniel Pinner has a degree in Jewish History from London University. He inherited his love for Jerusalem from his mother, Hana, who fought to liberate the city in 1948. Daniel can be reached for comments or suggestions by telephone at (03) 906-8079. Log in | Register |	88 queries. 0.778 seconds.